Growing up, I spent every other weekend with my dad at his parents house. His dad, my papaw, is a missionary Baptist preacher of a small church in a small town. 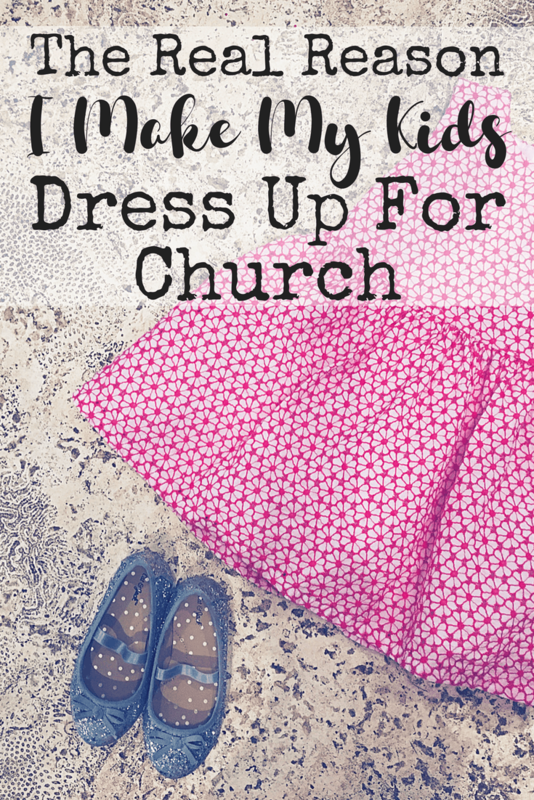 This post, The Real Reason I Make My Kids Dress Up for Church, contains affiliate links for your convenience. This means that if you make a purchase using my links, I will receive a small compensation at no additional cost to you. Read our full disclosure policy here. This meant that my sister and I wore dresses or skirts that were long enough to reach below our knees, and my brother wore nice pants and a button down or polo shirt tucked in. As a teenager, this really cramped my style. I wanted to wear jeans or short skirts but my grandma, Mimi, would have none of that. One time, I “forgot” to bring Sunday clothes, so Mimi just took me to Bealls (the department store in town) to buy me a nice outfit. This made me feel immensely guilty, so I only did that once. As I sat in my crisp new outfit Sunday morning, I vowed that when I grew up, I’d go to a church that I didn’t have to dress up. There are people who wear jeans and t-shirts and *gasp* shorts on Sunday mornings. And now I’ve got four kids who I have to get ready for church so obviously I just throw on whatever clean clothes I can find for them as we scramble out the door. Right? 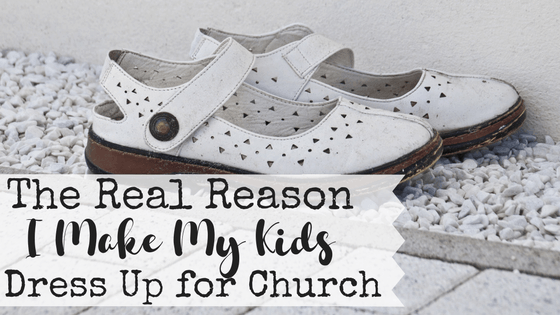 I dress my kids in dresses and skirts and khakis and button downs. It’s horribly difficult and results in at least one argument discussion about clothing every single Sunday morning. I make my kids dress up for church for three reasons. Recently, we all dressed up to go to a retirement party in a nice restaurant. It was a special place and a special night. If I can dress my kids up for a Friday night retirement party, I can definitely dress them up to go to God’s house. We dress up any time we go somewhere “fancy” – restaurants, parties, etc., so why, when going to a place set apart for the worship of the creator of all the universe, would we not dress up??? I know from my own experience that church buildings don’t just spring up from the ground. They are built thanks to the generosity and sacrifice of people with a heart to worship the Lord and desire to see others worship Him. While we don’t treat the building as “fancy,” I want my kids to know that the place is special. My husband is a pastor AND he wants to be a pastor. Although he rarely wears a suit or tie, he always wears a button down shirt and nice slacks. Often, these clothes have few to no wrinkles thanks to the magic of Downy Wrinkle Release spray and my Chi hair straightener set to 400 degrees. While the kids and I don’t actually get paid to be at church, to a large degree we are a part of his job. The kids and I represent our family, and are looked at every Sunday by most of the church. People love seeing Dax in his bow ties and Brinley in her dresses and giant hair bows. The few Sundays that I’ve slacked on their outfits, I’ve gotten more questions than you’d think children’s attire would warrant. My son, Dax, actually loves dressing up. He owns about 15 bow ties and wears them as often as possible. And letting him wear a bow tie actually helps to diffuse fights about why he can’t wear sweatpants and a Star Wars t-shirt on Sunday mornings. As I’ve said before, my kids already spend a lot of time at church. As pastor’s kids, they’re really comfortable in the church – which is great most of the time! However, it’s important for us to differentiate between a regular day that we are at church and Sunday morning worship. Dressing in special clothes helps the kids to make this distinction. We are going to fellowship with other believers, to grow in knowledge about God, and to worship the creator of the entire universe who loved us enough to send his only son to die for us. I think putting on special clothes triggers a psychological response in the kids. They look down and feel dressed up so they know that their behavior should match it. It’s a lot like teaching them to hold hands when we pray. It’s a physical reminder of a behavioral expectation. They’re not wearing regular school clothes, because this isn’t a regular day. Sundays are the day that we commit to worship God. Now please don’t misunderstand me. I do not care if other people dress up for church on Sundays. I want people to come as they are to church and learn about God and worship our creator. What you’re wearing isn’t an indication of your heart or your ability to worship and learn, but for my family, dressing up on Sundays is an important part of our Sunday morning ritual. Does your family dress up for church on Sundays? Why or why not? Tell us in the comments! Great article! I see so many in church service, not dressed in their best. I understand God accepts you how you are, but we should give our best to Him. Thanks Dawn! For us, getting dressed up is not only a physical reminder that Sunday morning worship is special, it’s also sacrificial. It’s not easy to get dressed up and it takes time and effort. Teaching that to four kids is hard, but I pray that one day that understand my reason! I wish more adults felt this way! I think this is an important article. Thanks for sharing! You speak my language….It is God’s house, a place of reverence and the least we can do is offer Him our best. This is exactly how I was raised and how we’ve raised our kids. I commend you for not giving in to the “norm” of today and for taking the time, energy and effort it takes to dress your kids accordingly. Good job Mom!!!!!! Thanks, Wendy! It’s not easy by any means, but I think it’s worth it. Which most things that are worth it, aren’t easy!